Maureen Goodman (seated third from left in third row) is UK Programmes Director of the Brahma Kumaris World Spiritual University. Photo taken on a retreat for young leaders at the Global Retreat Centre, Oxford. She talks to Dr. Atul Shah about her experiences on the themes of leadership and faith. 1. At a BK event, equality and diversity is highly visible – people of all colours, ages and abilities are welcomed gracefully and treated with respect. This is quite rare to see in modern workplaces. How do you achieve this? 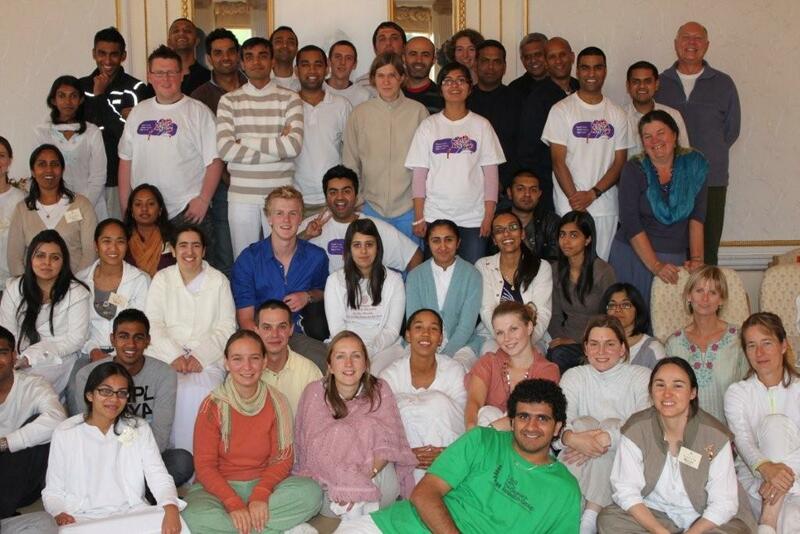 The Brahma Kumaris World Spiritual University is open to people of all backgrounds and of all ages. Our understanding is that we all belong to one human family; there may be many differences in our appearance, ways of living and ways of thinking, but there are some essential things we all share. The daily meditation practice of the Brahma Kumaris is of experiencing the inner being of the self, the soul and the inner peace and happiness that comes naturally from that awareness. This then easily translates into seeing the inner being of the person we are interacting with, rather than forming our opinions based on physical appearance or even current behaviour. Each one is a soul and each soul carries original qualities of peace, love, purity, happiness and wisdom. It is this vision that creates an atmosphere of openness, welcome and trust. In whatever we do, people of all cultures and backgrounds work together with love and respect. We have a global campaign, Just-A-Minute to encourage this shift in consciousness. 2. Employers are very nervous to talk about faith, even though faith has such a positive impact on employee health and performance. How can this attitude be changed? People feel nervous to talk about something they do not understand. Therefore, education of what faith is about, what it means to people and how it is practiced in everyday life, will help to remove that fear. Very often in the media, faith or religion is portrayed as something that creates disharmony, whereas the reality is that millions of people , through the practice of their faith, live lives of respect, compassion and tolerance, and make a highly positive contribution to society. People of faith also need to feel empowered to talk about their faith, without feeling that they would be misunderstood or misjudged. A positive step in this direction has been taken in the area of healthcare where spiritual care is now being acknowledged as an important part of the healing process. There is a greater awareness that to understand the needs of a patient it is essential to understand the context of their lifestyle which is often centred around their faith. Maybe this can spread to other areas of work. If people could talk openly about their faith we would have a safer more harmonious society. Perhaps whoever is reading this can begin to take steps to either talk about their faith or invite others to do so. If employers begin to do this then it will allow employees to feel free to do the same. 3. Great leaders are often inspired by faith. How can business and government leaders be allowed to share their faith with others, without denying it or hiding it? Maybe a project that Diverse Ethics could embark upon would be to collect personal stories of how faith has helped business and government leaders, not just in times of crises, but also in their day-to-day relationships and in particular has contributed to success in what they do. When we were collecting one minute interviews for the just-a-minute project, many people, including politicians and business people, were willing to share about how silence helps them in their life. It was very revealing. Perhaps when a few people start to share, others may be encouraged to do the same. It is as if we need to give people permission to share what is really meaningful to them. Maybe with a new-style government, it may be possible? 4. Workplaces need to have prayer facilities under the new Equality Bill, but many are nervous about how to do this. Do you have any suggestions? It is important that prayer places are such that people of any faith feel comfortable to go to. A prayer room really belongs to everyone and not to any one faith. So either it could be devoid of religious symbols, or showing all religious symbols; maybe the former would be more easily managed. So often prayer rooms are an after-thought and not very inviting, but it is important that a prayer room is comfortable, with soft lighting and in a place where there is quiet. When something is given importance, it is more likely to be used well and valued by people. Simplicity is the key. As people use a prayer room it gathers a special atmosphere which makes it welcoming to others who wish to pray. It should strictly be kept for the purpose of prayer so that the atmosphere can develop. No Faith in Finance? - Every day, billions of pounds change hands in London's square mile. This square mile is full of churches and one of the most beautiful cathedrals in Britain, St. Paul's, lies at its heart.